I was really looking forward to making something exciting for Elsa's Online Sandwich Party, but between present wrapping and toddler wrangling and car buying, I unfortunately didn't get a chance. I did make a grilled cheese sandwich for the kiddo last night, though, and it got me thinking. In French cuisine, they have this concept of "mother sauces." These are 4 basic sauces that can be added upon and tweaked to make a practically infinite number of other sauces... the primary colors of the food world, in a way. Well, if the concept carries over to the sandwich side of things, you have to figure that the grilled cheese would be one of the mother sandwiches. The basic idea is ridiculously simple, and the variations you can create are limited only by your imagination and the contents of your fridge. 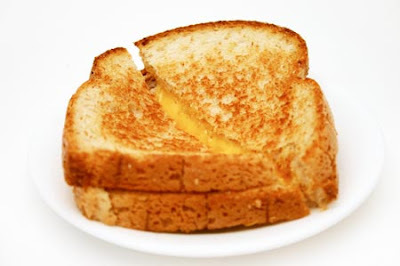 At its core, a grilled cheese is melty cheese on toasted bread. That's it. There aren't any requirements that need meeting beyond those... it can be Velveeta on Wonder Bread or Gruyere on a baguette. You can eat the sandwich on its own, or pair it with some chips or a nice bowl of hot soup for a great lunch on a cold day. You can even break it down into its component parts of cheesy glop and toast and enjoy some Welsh Rabbit, if you like. And of course, like the greatest innovations of Scandinavia - I'm speaking, of course, of Lego and Ikea here - it's modular. Want a little kick? Add some spicy mustard. Need some vegetables in there? Add a slice of tomato. Grill up a hot ham (or even bologna) and cheese if you want a heartier sandwich. Looking for a quick bite to eat for breakfast? Use an English muffin or a bagel, throw on a bit of scrambled or fried egg and maybe even some ham or bacon and make your own Egg McWhatevers at home. And come on, how many other sandwiches can you name that have been the source of religious wonderment? 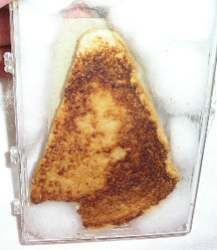 That's right, friends... even the Blessed Virgin herself enjoys a nice grilled cheese once in a while (though, to be completely honest, I've always thought this particular sandwich seems to resemble a Grease 2-era Michelle Pfeiffer myself, but we all see what we want in these sorts of miracles, I suppose). The grilled cheese - so easy that it's the first thing most of us learn to cook for ourselves, but also the gateway to myriad, perhaps even divine, possibilities. The inexplicably popular (well, for this site, anyway) Top 5 Sandwiches Post. My attempt to make Elvis proud: The King Panini. No matter how often I see it or how squintily I gaze upon it, I only ever see Mary Pickford in the crust of that (putatively Madonna-graced) grilled cheese sandwich. Huh. I get Deborah Harry. Alton would so proud of you. Suit up, man. Round two of the Sandwich Party is coming up.